After the Cold War ended, many U.S. military leaders were worried that the defense budget would be slashed dramatically. Gen. Colin Powell, then chairman of the Joint Chiefs of Staff, expressed the concerns of many when he said he feared there would be a stampede in Congress to shift money from the military budget to such things as schools, housing and crime prevention. Still, there were those who recognized the need to shift funds from defense to social needs. The late Sen. John Tower, for instance, said during the 1989 hearings on his unsuccessful bid to become secretary of defense in the first Bush administration that if the Soviet Empire collapsed, the U.S. obviously would reduce its allocation of resources to defense. Tower was a defense hawk who, as chairman of the Senate Armed Services Committee, was largely responsible for the Reagan buildup, but he asserted that the United States could be spending enormously less on defense in the absence of a Soviet threat. "If there were no Soviet threat," he said, "we'd be maintaining the kind of Army we had in 1938, [which was] about half the size of what the Marine Corps is now" (or about 197,000 troops). active duty Army still has nearly 500,000 soldiers. Even the Marine Corps is not half the size it was a decade ago. Today's Corps has 172,000 marines, down only about 12 percent since 1989. Nor are we spending enormously less on defense than we spent during the Cold War. In fact, the budget for fiscal year 2002 that President George W. Bush just outlined to Congress calls for spending $324.8 billion, which is $14.2 billion more than the spending slated for this year (and the likelihood of additional spending is high). Even if one adjusts for inflation, we are again hovering in the range of our defense spending during the Cold War. Our military spending is nearly three times that of all our potential adversaries combined. Yet we have not shifted enormous sums of money from defense to such areas as education and housing. In fact, for fiscal year 2001, Congress passed a budget resolution that gives the Pentagon 51.3 percent of the total discretionary budget. One would think the current situation has materialized because the threats we face are growing or our adversaries are spending more. In fact, the U.S. share of the world's military spending today stands at about 35 percent, substantially higher than during the Cold War. In 1985, at the height of the Reagan build-up, the United States and the Soviet Union spent equal amounts on defense; now Russia spends only one-sixth of what the United States spends. If one adds in the spending of U.S. allies, the picture becomes even more favorable to the United States. Our NATO allies spend three times more on defense than Russia. Israel spends as much as Iraq and Iran combined. South Korea spends nine times more on defense than North Korea. And Japan spends more on defense than China. The main reason political leaders from both parties and continue to approve ever larger expenditures on defense than necessary is that they have accepted a series of misleading assumptions, or half-truths, about the current state of America's military. Before developing a more realistic budget, it is important to confront these myths squarely. MYTH #1: Defense spending should be increased because it consumes the smallest portion of the GDP and the smallest percentage of the overall budget since the beginning of World War II. This argument has been advanced by President Bush, Sen. John McCain (R-Arizona) and former Army Chief of Staff Dennis Reimer. While this statement is true as far as it goes, it tells us more about the tremendous growth of our economy, the rising cost of health care, and the aging of the population than it does about national security. Moreover, it implies that the U.S. military is now in as bad shape as it was in 1940. What has been forgotten is that, at the beginning of World War II, the U.S. military was was one-tenth the size of Germany's, half the size of Japan's, and ranked 16th in the world. MYTH #2: The defense budget has been reduced over the past decade to help lower the budget deficit. Now that the federal budget has a hefty surplus, defense spending should be increased. The defense budget has been reduced from the lofty levels of the Reagan years primarily because the Cold War ended and the Soviet Union collapsed. Moreover, the total combined defense expenditures in 1999 of the "countries of concern" (formerly "rogue states")--Iran, Iraq, Libya, North Korea, Cuba and Syria--was $13.8 billion, or about 4 percent of the U.S. defense budget. The United States and its allies account for 65 percent of the world's total military expenditures. defense programs and defense resources. The Joint Chiefs claim there is a $150 billion gap between current defense funding and what is needed. The fact is the Joint Chiefs will never be satisfied. Had we listened to them during the Cold War, this nation would have spent several trillion dollars more, throwing money at all sorts of nonexistent gaps in our defense. MYTH #4: The military needs more funding to implement its two-war strategy. Such a position--the need to be able to conduct two major conflicts simultaneously--defies both logic and history. When the United States was bogged down in Korea, Vietnam and the Gulf wars, no other nation threatened U.S. vital interests elsewhere in the world. At least two bipartisan groups established by Congress since the end of the Cold War have rejected the two-war strategy, simply calling it a justification for larger forces. Yet it remains a guiding policy of the U.S. military. MYTH #5: Deploying troops in peacekeeping operations like Bosnia has diverted large sums of money from core defense functions. In fact, peacekeeping operations consumed less than 2 percent of the defense budget during the Clinton administration. Only 10,000 U.S. troops, out of a total force of 2.3 million, are currently involved in these small-scale contingencies. Furthermore, the threat from regional "rogues" has been wildly overestimated and is rapidly declining. 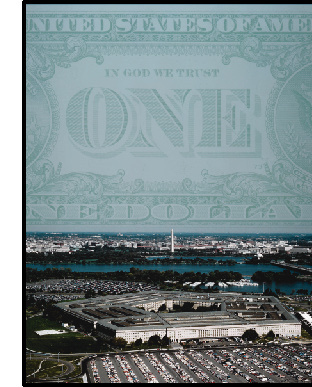 MYTH #6: The Pentagon needs more money because it is facing an investment shortfall. The secretary of defense and the Joint Chiefs claim the Pentagon has needed $60 billion a year in new equipment to keep its forces modernized. But during the past five years, the Pentagon on average has spent less than $50 billion on new equipment. Moreover, the $60 billion dedicated to new equipment in the fiscal year 2001 budget has put the U.S. military in an arms race with itself. For example, the amount of money earmarked for new equipment assumes that the Defense Department must replace its current generation of tactical aircraft, the F-16, F-15, F-14 and F/A-18 C/D, with the newer, more sophisticated and much more expensive, F-22 and F/A-18 E/F, even though the current aircraft are already the best in the world. Similarly, the Pentagon claims it needs a new generation of submarines, even though the current generation has many years of useful life left--and no next generation of Soviet submarines to threaten it. Finally, the current $60 billion benchmark ignores the fact that the U.S. procurement budget is 40 percent more than all of our allies combined, 75 percent more than either Russia or China, and nine times greater than that of Iraq and North Korea put together. MYTH #7: The readiness of our armed forces is declining because we are not spending enough on "operations and maintenance," which is the money it takes to keep weapon systems functioning. In fiscal year 2000, real operations and maintenance spending per capita was 10 percent higher than at the height of the Reagan build-up, exceeding $100 billion for an active duty force of 1.36 million. Moreover, the armed services are still using the same readiness criteria as they did during the Cold War to justify additional expenditures. Even if the mission-capable rates of tactical aircraft have declined by 5 percent or even 10 percent compared to 1985, as some have claimed, that's not a real problem unless the North Korean or Iraqi military is 90 to 95 percent as capable as the Soviets were. MYTH #8: The services are failing to meet their recruiting goals, even though they have lowered the quality standards they maintained in the '80s. On the contrary, the armed services now have a higher percentage of "high quality accessions" (high school graduates and people scoring average or above average on the armed forces qualifications test) than at any time during the Reagan years. already are the best in thes world. percentage of the force is deployed overseas than during the Cold War. Some have claimed that the military has been deployed overseas once every nine weeks in the past decade. The fact of the matter is that in the '80s more than 500,000 (or 25 percent) people of an active duty force of 2.1 million were deployed outside the United States. Today that number is about 230,000 or 15 percent of an active force of 1.36 million. MYTH # 10: There is a pay gap between the military and civilian sectors; therefore, pay and benefits for all military personnel must be increased substantially. As evidence of the gap, proponents of a pay raise claim that the military suffers a 13 percent pay gap relative to the private sector. They also argue that this has created a situation in which 12,000 military people are on food stamps. But as Cindy Williams, former head of the Congressional Budget Office's National Security Division, has demonstrated, there really is no pay gap. The majority of the men and women in the armed services earn more than 75 percent of their civilian counterparts. An entering recruit with a high school diploma makes $22,000, while an officer earns $34,000. After 20 years, the salary of an enlisted man exceeds $50,000, while that of officers tops $100,000. In addition, throughout their careers, military personnel are eligible for a wide variety of bonuses and receive a generous package of fringe benefits (free health care, generous noncontributory retirement, etc.). While it is true that some 12,000 military personnel are technically eligible for food stamps, the Wall Street Journal has pointed out that the vast majority of them are individuals with large families in the lower ranks who live on-base. Because they live on-base in rent-free quarters, they do not receive their housing allowance. If they lived off-base, or if their compensation were adjusted to reflect the fair market value of their housing, most of these people would not be eligible for food stamps. Correcting these distortions reduces the number to less than 1,000 soldiers. None of this analysis is meant to indicate that the military does not face challenges. But these challenges or problems can be met without throwing more and more money at the Pentagon. The majority of the problems faced by the Pentagon are self-inflicted. 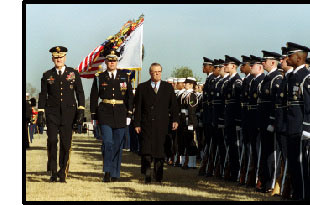 In the '90s, the Defense Department conducted three reviews of its strategy and force structure. Despite the fact that these reviews were conducted by three different secretaries of defense, they did not result in any fundamental changes. Structurally, the force of 2000 is little different from what it was a decade ago. Although the force is somewhat smaller, it is in essence a "Cold War-Lite" force. The troops drive the same tanks, fly the same planes, and sail the same ships as they did in 1990. Moreover, they use the same procurement strategy and employ the same organizational and operational models. While such a development is understandable from a bureaucratic and political view, it has given America the worst of all possible worlds. Not only do we spend more than is necessary on defense, we get far less than we should for our money. A true bottom-up review that resulted in a realistic budget would give us a more effective defense at a greatly reduced cost. What would this budget look like? The United States could have a realistic defense budget for around $260 billion, which is about 20 percent less than the $324.8 billion budget proposed for fiscal year 2002 by President Bush. The reasons for the current excess in U.S. defense spending are clear. Our leaders have accepted a number of half-truths about defense spending, the current shape of our armed forces and the threats to our national security. They have not shown the political courage to stand up to the Pentagon and its supporters who wittingly or unwittingly mouth these misleading statements. If these trends continue, the United States is likely to spend at least $500 billion more on defense in the coming decade than is necessary to provide for our national security. Although we are a wealthy nation, and currently have a budget surplus, this is still a large amount of money that could be put to much better use elsewhere. Lawrence J. Korb is vice president and director of studies at the Council on Foreign Relations. From 1981 to 1985, he served in the Reagan administration as assistant secretary of defense for manpower, reserve affairs and logistics. 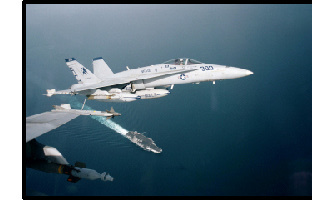 This article is excerpted and updated from "A Realistic Defense Budget for the New Millennium," a report produced by Korb in conjunction with Business Leaders for Sensible Priorities (www.businessleaders.org).